I went shopping last Sunday to buy new decors for our small Christmas Tree and I had fun putting up the tree and decorating it last night. My color theme for this year is orange with touch of gold. 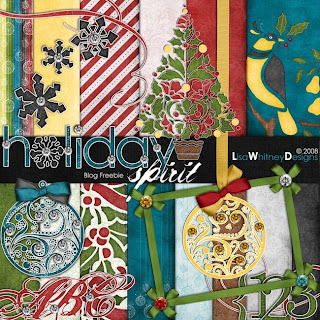 Anyway, Diane a co-digiscrapper of mine alerted us with this very pretty kit Holiday Spirit by Lisa Whitney. When I saw it I could not resist not to download it. It may seem early but at least we'll have kits to use when we scrap our Christmas photos. Download it at LISA WHITNEY's blog and don't forget to say thank you! Awwww, thanks Jenny. You are such a sweetie!!! Hi, I just stumbled on your blog and wanted to tell you: I love your header, with you swinging from a tree! It brought a smile to my face, so thank you.